Liam Chawke Electrical in Rathkeale can offer Commercial Pressure Washer Sales or Hire agreements to customers throughout the Midwest region of Ireland. Kranzle powerful professional cleaning machines perform cleaning tasks economically and in an environmentally friendly way while providing optimum results. You can be sure a Kranzle commercial pressure washer will provide years of dependable service. Only Kranzle offer 12 months commercial warranty as standard on all pressure washers sold. If you would like us to inspect or service your Kranzle washer near the end of the first 12 months, then Kranzle can extend the warranty for a further 12 months. (24 months total). Kranzle can offer such a strong warranty because they have less than 1% warranty claims internationally. If you are one of the few with an issue or a fault, we will act quickly to rectify it. Most ‘problems’ can be solved by ensuring the correct set-up instructions have been followed as shown in the operators hand book. As an Approved Kranzle Service Centre, we will listen, help and advise our customers whenever required. We have our own workshop in Rathkeale, available for both servicing or repairs and Kranzle technical support and parts availability are second to none. Which Karnzle Power Cleaner do I need? 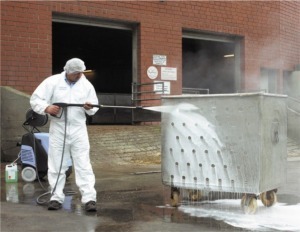 If your application involves commercial or industrial high pressure cleaning on an ongoing basis (over 50 hours per month) we would strongly recommend that you purchase one of the Kranzle Industrial models, e.g. the Kranzle Quadro 599TST or the Kranzle 1000TST, or a hot water Therm unit such as the Kranzle Therm CA 11/130. Not only will you have a power cleaner that cleans more efficiently – getting your job done faster with less water and power usage – but you will also have a high pressure washer that will last longer, cost less to maintain, and hold it’s re-sale value when the time comes to upgrade.